It was another banner meet for swimmer Elinah Phillip. 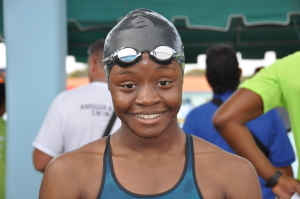 The 13-year old who still has another year in the 13-14 division, shattered five OECS Swimming Championships records over the weekend en route to winning 10 of the territory 15 medals—including six gold—during the 24th edition of the competition that wrapped up at the Rodney Heights Aquatics Center in Gros Ilet, St. Lucia, on Sunday evening. Teaming with her sister Amarah for the medal haul, Elinah set three new records on Sunday, on her way to winning the 13-14 category. Elinah swam the fastest ever 200m Individual Medley (2:33.20), 50m Butterfly (29.75) and 100m Freestyle (59.83) in OECS history. On Saturday, Elinah grabbed silver in the 200m Freestyle in 2:16.99, before missing a 50m Breaststroke bronze by .30 seconds with a time of 37.71. She followed up by smashing Grenada’s Oreoluwa Cherebin’s 2-year old 100m Butterfly mark of 1 minute 10.70 with a swim of 1:09.24 for her first OECS mark. Elinah snatched another of Cherebin’s OECS records, when she bettered the 50m Freestyle time of 28.31 from 2012, with a 27.52 effort. The 13 year old—who kick started her medal haul on Friday with a bronze medal in the 400m Freestyle, finishing in 4:56.36—settled for bronze In the 100m backstroke, after missing silver by .36 seconds with a time of 1:14.73. Amarah landed silver in the 15-17 Girls 100m Breaststroke in 1 minute 16.89 seconds, then tied St. Lucia’s Thalia Bergasse in the 50m Freestyle as both clocked 29.39 seconds. She finished second to Cherebin in the 100m Butterfly with a time of 1:11.79 as Cherebin improved her own 1:09.81 mark from last year to 1:08.08. The 15 year old also picked up 50m Backstroke silver in 34.49 and 50m Butterfly silver by stopping the clock at 31.03. Amarah also settled for 5th in her 200m Freestyle race in 2:25.71, and had another fifth in the 50m Breaststroke in 40.02 and was also 5th in 400m backstroke with a 5:17.06 mark. Gregory Nelson II was 13th in the 13-14 Boys 50m Freestyle in 30.30 seconds. He placed 15th in the 400m Freestyle and had the same position in the 200m discipline in 2:51.50, then recorded a time of 46.86 seconds in the 50m Breaststroke good for 15th. 50m Butterfly in 59.44. Jaden Marshall finished 11th in the 9-10 Boys 50m Freestyle in 36.25. Giselle “Gigi” Archibald Bowers finished just outside the medals in the 9-10 Girls division 50m Freestyle after getting to the line in 33.22 seconds, good enough for fourth place. She was seventh in 400m Freestyle in 6:23.99 and 8th in the 50m Butterfly in 41.93. She was 10th in the 200m Freestyle in 3:11.85, while Kassiaa Haymer was 14th in 4:00.47. Haymer was 14th in the 50m Freestyle while Chakia Smith recorded a time of 53.01. Bowers teamed with Kassiaa Haymer, Chakia Smith and Kahdija Sampson in the 200m Medley Relay where they were fifth in 3:26.37. The six year old pair of Sampson and Tia Roberts were 13th and 14th respectively in the Girls 8 and Under 25m Backstroke in 40.25 and 1:22.36 respectively and 30.00 and 50.80 in the 25m Butterfly. Roberts’ sister Kayla had a time of 42.67 seconds in her 50m Freestyle, good for 11th.